Click here to see the elegant "Ralock" semi-automatic rifle and the "less remarkable "Armatic". We start here with the earliest model - the slide or "pump action" rifle. The B.S.A. 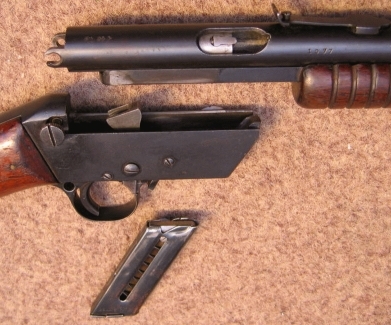 slide action rifle was the British equivalent of the Winchester, Remington and Fabrique Nationale - (FN) Browning pump-action repeating rifles. 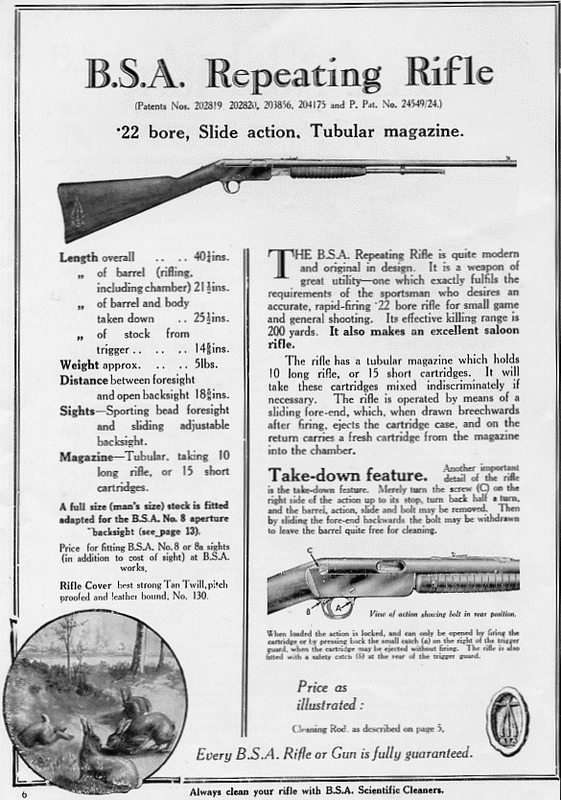 It was manufactured mainly with the tube magazine as shown, but early in production from 1923, a small number ( probably a maximum in the very low hundreds*) of these rifles were produced with a box magazine. This version was then little advertised and is rarely come across today. The action is simply marked "Patent Pending" . 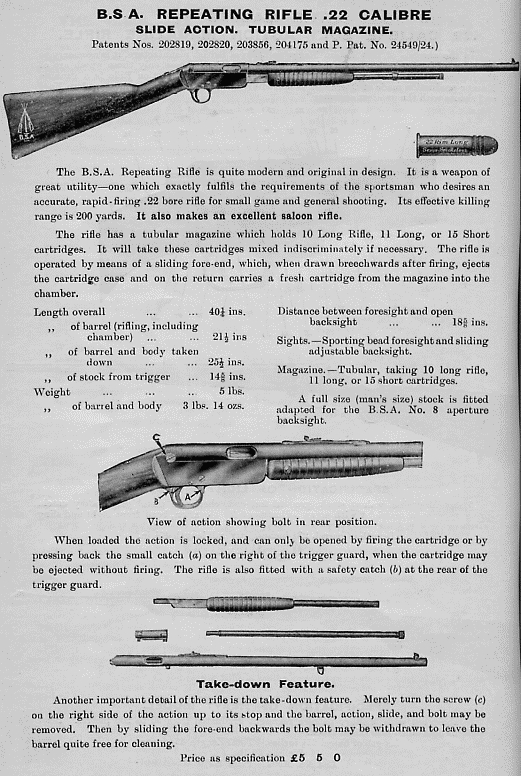 A pretty and well balanced design, the operating system was not as reliable as its well-proven American counterparts and sales probably suffered as a result, although prices in the U.K. were fairly well in its favour by comparison with the Remington and Winchester slide or "pump" action rifles, all being only a few shillings either side of £5.00 in 1925. The then newly introduced Browning pump-action rifle was entirely a different matter. This hit the market running at the incredibly competitive price of only three pounds and five shillings (£3.25). for this box magazine action. Click on the drawing for the complete specification. The following year saw the introduction of the Tubular Magazine Model, of which around 8,000 were manufactured before the the commencement of the Second World War* brought such production to an abrupt close. 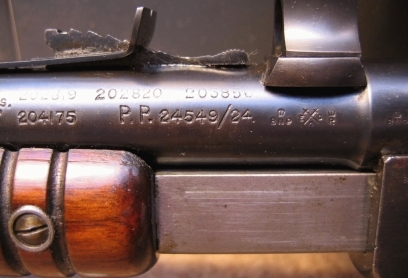 The manufacture of this design was destined not to be reinstated post-war, effectively leaving the market for slide-action rifles clear for Winchester and FN (Browning). 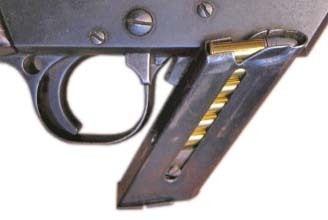 The rifle above has been professionally fitted with a sophisticated pair of quick release offset claw mounts for a German manufactured "Gnomet" telescopic sight (not illustrated), and the muzzle has been threaded for a sound moderator - the knurled cap at the muzzle being the screw-on thread protector for when the silencing system is not in use.